As Guyana prepares to host the November 19th – 23rd Ninth Caribbean Beekeeping Congress there is the considerable likelihood that deliberations at the forum could precede the end of a three-year-old ban on locally produced honey either entering Trinidad and Tobago or transiting through that country for any other destination, Vice President of the Guyana Apiculture Society (GAS), Linden Stewart has told Stabroek Business. 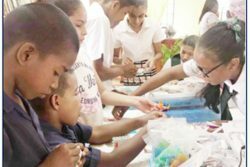 Deliberations at the forum to embrace the removal of the ban would follow last month’s signal from the Trinidad and Tobago government that it could be on the road to amending longstanding legislation and regulations for the removal of restrictions on the trade in honey. The ban has not only impacted on Guyana’s honey exports to the twin-island Republic but has also, on account of the transit restriction, negatively impacted on Guyana’s exportation to other countries in the region. Stewart told Stabroek Business that the presence of a Trinidad and Tobago delegation in Georgetown for the Congress is likely to facilitate discussions that could settle key issues pertaining to the lifting of the restrictions. During his visit to Guyana as part of a delegation headed by Prime Minister Dr. Keith Rowley earlier this month Trinidad and Tobago’s Agriculture Minister Clarence Rambharat committed his country to undertaking an examination of the law prohibiting the transshipment of honey from Guyana into the twin-island republic. Observers here are viewing what now appears to be the imminent removal of the ban on Guyana’s honey imports into Trinidad and Tobago as a microcosm of a wider warming of relations between the two countries reflected in the signing of a wide-ranging memorandum of understanding between Rowley and Guyana’s President David Granger in Georgetown in September. And while Stewart was quick to point out that the economic significance of the removal of the ban was likely to be modest given the relatively small volumes of honey imported into Trinidad and Tobago from Guyana, what it meant was that the removal of transit restrictions afforded the opportunity for pursuing expanded markets for other countries in the region including Barbados. Stewart explained that the ban on honey imports into Trinidad and Tobago from Guyana is based on an archaic regulation pertaining to the exclusion of honey from countries where bee hives are believed to be infected. 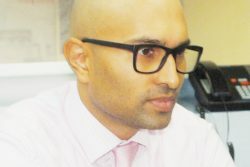 Stewart said that the ban had persisted notwithstanding the fact that Port of Spain had produced no evidence of hives in Guyana being infected. But while Stewart believes that the lifting of the ban could re-open what is still a modest but important regional market for Guyana’s honey, he insists that government needs to do more for the sector if locally produced honey is to take further advantage of the Caribbean market and extend its honey sales beyond the region. Specifically, Stewart told Stabroek Business that the future of the local honey sector will depend largely on government’s preparedness to invest in the requisite infrastructure associated with the building of the industry. 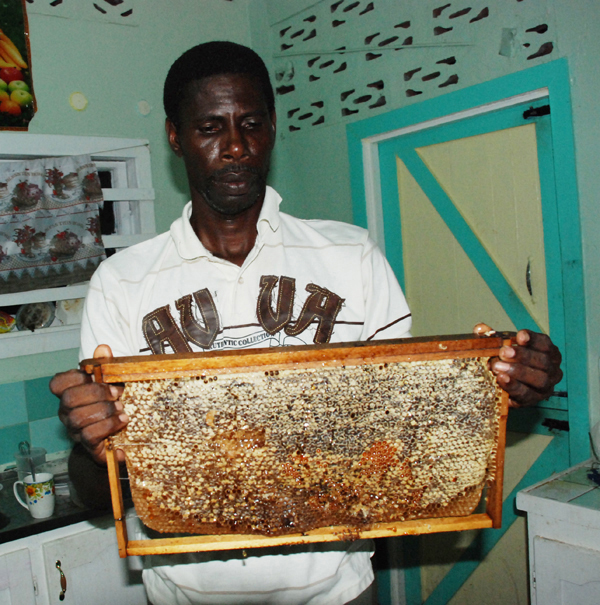 The man dubbed by sector officials as ‘the master beekeeper’ says that while he believed that Guyana produced “by far the best quality honey in the Caribbean” and that there was potential for a lucrative market both within and outside the region, what is still a modest industry remains heavily dependent on the support of the Ministry of Agriculture. “The greatest potential lies in the interior regions of the country and apart from the funding that is needed to develop infrastructure and raise awareness among hinterland communities of the economic value of apiculture, there is also the need to invest in training and awareness programmes in coastal communities where there is potential for the sector to grow,” Stewart said. He added that government can further support the sector by granting duty-free concessions on bee-keeping equipment imported into the country. Specifically, Stewart wants to see monies allocated directly for the bee-keeping sector in the country’s 2019 budget. The global apiculture market value, it is estimated, will rise at an annual growth rate of 2.6% from US$8.81 billion in 2017 to US$10.28 billion in 2023.
International industry experts believe that the sector has enormous potential for investment as demand increases at an accelerated rate from 2018 to 2023. 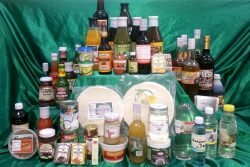 Europe is the dominant market for bee products and a major importing region with sales of bee products valued at US$3,218 million and estimated to grow by more than 2% in the next five years. Globally, the use of honey continues to expand at a rapid pace in the food and beverages industry, a trend that is driven largely by the demand for healthy and natural products in both developed and developing countries with experts predicting that the marketplace for honey in the coming years will be dictated by increasing preference for natural sweeteners in the food and beverages industry. Growth in the global market is also likely to rise further on account of the popularity of honey-based cosmetic products. Watchers of the local honey industry are of the view that the litmus test of the worth of the sector is linked to its ability to access the local market, notably Banks DIH Ltd. Banks, according to Stewart, had originally purchased honey from a local supplier to sweeten its malt beverages but had shifted its patronage to a foreign source on account of what he said were ‘quality issues.” Stewart told Stabroek Business that while two local companies, Kingdom Apiary and Bee Haven had received positive responses from the local beverage company to samples submitted for testing, discourses on purchasing honey from the two companies had fallen through on account of “price issues”.